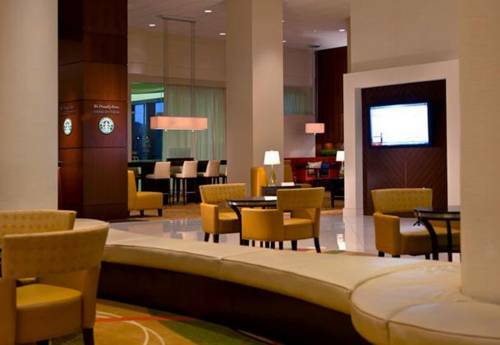 BWI Airport Marriott welcomes you with comfort, style and award-winning service. Ideally situated just one mile from Baltimore/Washington Thurgood Marshall Airport, our hotel offers complimentary shuttle service to and from the terminals, eliminating the stress of travel. All of our spacious rooms and suites feature deluxe pillowtop mattresses, comfortable workspaces, high-speed internet access and coffee/tea makers. Additional hotel perks include a fitness center, a heated indoor pool and even a ping pong table. Enjoy a variety of dining options, from fresh seafood at Chesapeake to relaxed American cuisine and multiple flat-screen TVs at Champions Sports Bar & Restaurant - as well as the vibrant Day/Night Bar, which serves Starbucks coffee. Our expansive event venues can accommodate meetings and celebrations of up to 1,500 people; if you're interested in exploring, we're a short drive from downtown Baltimore, as well as Maryland Live! Casino and UMBC. We look forward to your visit at BWI Airport Marriott. Chesapeake: This stylish restaurant is a favorite among both hotel guests and locals. Open for breakfast, lunch and dinner, it's a great spot for a delectable seafood meal before or after your flight out of BWI Airport. Champions Sports Bar & Restaurant: There's no need to miss your favorite sporting event during your Baltimore-area visit. Our relaxed restaurant and sports bar boasts 18 TVs and a JumboTron with six flat-screen TVs. The kitchen is open late for those arriving in the evening from BWI. Lobby Bar: Day/Night Bar proudly offers Starbucks coffee drinks, so you can get your caffeine fix before or after a busy day near Baltimore. Make use of free Wi-Fi access in the restaurant, too. Fresh Bites: Enjoy handmade, locally sourced food without the fuss. All orders include eco-friendly utensils, napkins and cups; Everything you need to enjoy in your room or on the go. Call At Your Service from your room to place your order.